The Seattle design is the most impressive compared to the other entries. Safety in the area was achieved with slowing of traffic which was the top concern. But the project went beyond that increasing its multifuntional usage with the wastewater treatment design. Putting the drainage area between people using the park and the road increases safety. The use of the plants in the drainage echoes the park’s greenspace, attracts birds, butterflies and insects while doing triple duty using the water to grow and filter the water while slowing run-off into the drains. I had my reservations that this park would render this important arterial for cars useless but my experience driving on it with the new park has proved me wrong. This was quite a brilliant piece of design for how it took into account the needs of multiple stakeholders while also serving different functions. Hopefully, others may come to similar conclusions and vote Seattle’s design the top one. I agree. 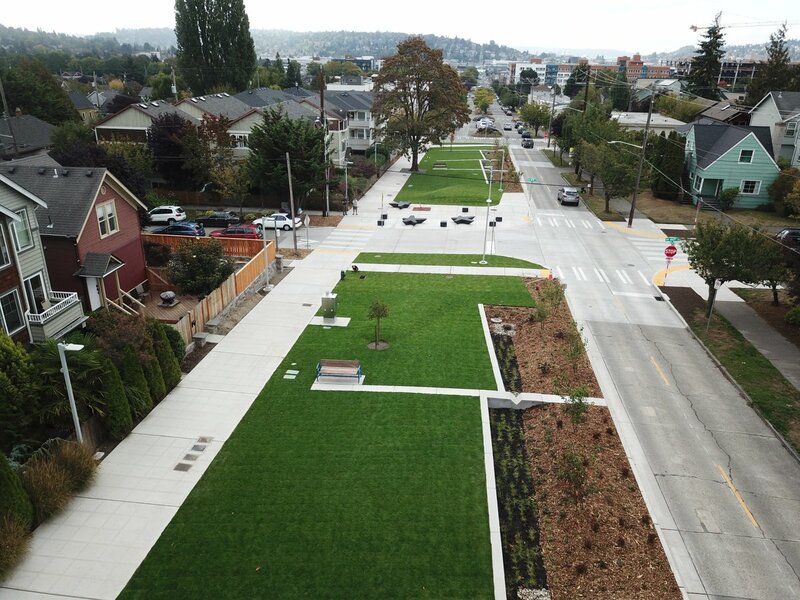 This is a great use of public space and I would love to see the park extended the full length of 14th Ave NW.